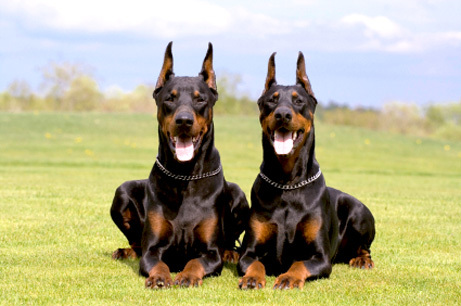 ﻿﻿The Doberman Pinscher was developed in Germany during the late 19th century, primarily as a guard dog. His exact ancestry is unknown, but he's believed to be a mixture of many dog breeds, including the Rottweiler, Black and Tan Terrier, and German Pinscher. With his sleek coat, athletic build, and characteristic cropped ears and docked tail, the Doberman Pinscher looks like an aristocrat. He is a highly energetic and intelligent dog, suited for police and military work, canine sports, and as a family guardian and companion. Because the Doberman Pinscher came into existence at the end of the 19th century, he is, in the world of dogs, the new kid on the block. This hasn't stopped the Dobie, as he is affectionately called, from becoming one of the most popular and recognized breeds in the United States. His look is elegant and his style is athletic; the Dobie is also intelligent, alert, and loyal. He is a courageous guard dog as well as a beloved family companion. The Dobie's fierce reputation precedes him. He is feared by those who don't know him, stereotyped as highly aggressive and vicious. True, he is a formidable guardian, but he is usually a gentle, watchful, and loving dog. He does not go looking for trouble, but he is fearless and will defend his family and turf if he perceives danger. 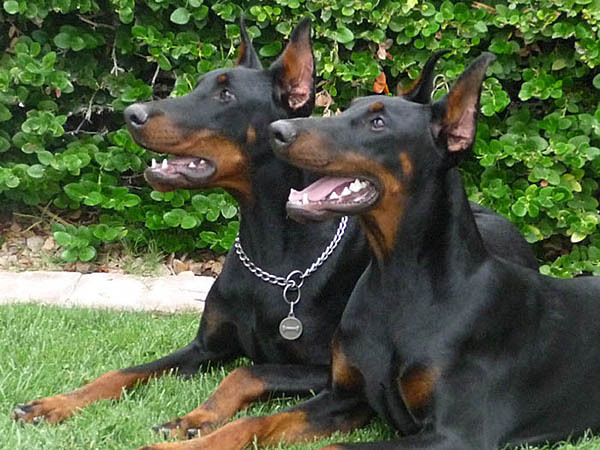 The Doberman Pinscher enjoys being part of a family. He likes to be close to those he loves and, when this love is present, he is a natural protector. He is trustworthy with his family's children, friends, and guests as long as he is treated kindly. In spite of his positive qualities, the Dobie isn't the right breed for everyone. He's large, at 70 to 95+ pounds, and he's extremely active, both physically and mentally. He needs a lot of exercise. He also needs plenty of mental challenges to keep him from becoming bored. He needs a strong owner/pack leader who can take time to properly socialize and train him, and who will keep him busy every day. This may be too much to handle for people who lead a more laid-back lifestyle. The current look of the Dobie is slimmer and sleeker than that of past years. His temperament has also changed somewhat, say breed enthusiasts, softening a bit from his early days in Germany, though he is still an excellent guard dog. Originally, Dobies' ears were cropped to increase their ability to locate sounds, and tail docking gave the breed a more streamlined look. North American breeders usually dock the tails and crop the ears of Doberman puppies, though it's not mandatory. Docking and ear cropping is illegal in some countries. Those who know him say that a well-bred and properly socialized Dobie is an excellent pet and companion, suitable for families with other dogs, gentle with young children, and overall a loyal and devoted family member. 2. The buyer must have the puppy examined by a licensed veterinarian within two (2) days of pick up or arrival if shipped; excluding Sunday and holidays. Buyer must retain all Medical Records. 3. The buyer is responsible for the daily health care and maintenance of the pet, including all immunizations and examinations recommended after purchase, as well as providing necessary medication and follow up treatments from veterinarian visits. In order for the guarantee to remain in effect you must keep receipts and records to verify that you have taken your pet to a duly licensed veterinarian for checkups and all required immunizations. 4. In the unlikely event of the death of the puppy within one (1) year from its birth due to genetics, the seller shall replace the pet with another of equivalent value at no cost to the buyer. 6. The value of the puppy for the purpose of this guarantee is solely the original purchase price of the puppy, and does not include shipping costs, health certificate, shipping crate or any additional prices declared by the buyer. 7. This guarantee is non-transferable. In the event his guarantee is exercised, the registration papers must be returned to the seller. 9. The seller is solely responsible for supplying the original registration papers. Any costs to obtain new or renewal registration papers are the sole responsibility of the buyer. If the papers are lost, the seller will assist the buyer in obtaining new papers at the buyer’s expense. 10. The seller makes every effort to provide accurate and up-to-date information on the website regarding the puppies they sell. This information includes, but is not limited to, breed, gender, color, date of birth, weight, parent’s weight and registration. The seller is not responsible for typographical or photographical errors. 11. Usually the puppy will ship within 7-10 days of its 8 week birthday, but occasionally a puppy may need additional time with the seller before shipping, The final determination of the shipping date for the puppy is made by the seller’s veterinarian, with the health of the puppy being the overriding factor. 12. An administrative fee of $400.00 shall be retained by the seller should the buyer decide to cancel anytime prior to shipping. This fee is to reimburse the sell for out-of-pocket expenses and overhead costs associated with the transaction. All deposits are non-refundable. 13.Transportation of the puppy is arranged through third party carriers. Occasionally there may be delays for numerous reasons including, but not limited to, weather, temperature restrictions, logistics, mechanical failure, or other unforeseen events. The seller shall not be liable directly or indirectly for any delays that may cause the buyer inconvenience or financial loss. 14. The seller disclaims any and all implied warranties of merchantability and fitness. 15. The seller will not accept any returns of said puppy for monetary refund, including but not limited to, allergy, landlord/tenant, martial, or adjustment problem, etc. If buyer must return puppy for any reason, it will be on a surrender basis only with no refund or credit. We will then find a home for the puppy/dog with a new family. Any conviction of animal cruelty and/or neglect shall result in the immediate surrender of the puppy/dog back to the original seller. In the unlikely event that the puppy is found to have a congenital or genetic defect that is life-threatening within one year from birth, a statement from 2 different licensed DVM’s (Doctor of Veterinary Medicine) of buyer’s choosing confirming such an event and cause is required before any action will be taken by the seller. Seller must be notified within two days from the date of veterinary examination. Seller reserves the right to a third party opinion of seller’s choosing to determine the congenital defect. If this guarantee is exercised and a replacement puppy is given then the original puppy must be returned to the seller. All shipping costs are paid by the buyer. All laboratory verification must be done by a licensed DVM. Failure of the buyer to provide puppy with timely inoculation and regular veterinary care will void this guarantee. This guarantee does not cover any veterinary costs. The buyer is aware that owning a puppy means frequent visits to a licensed veterinarian and understand that he/she will be responsible for all payments. This guarantee does not cover any of the following conditions: intestinal parasites (coccidiosis, giardia, tapeworm, hookworm, roundworm), kennel cough, pneumonia, ear mites, skin mites, mange (sarcoptic, demodectic, or cheyletiella), cherry eye, allergies, herniations (inguinal, perineal, or diaphragmatic), heart murmur grades I & II, patella luxation grades I, II & III, hypoglycemia or diabetes, anemia, or any other non-life threatening illnesses. This guarantee does not cover any veterinary costs associated with spaying or neutering, including undescended testes. Our guarantee does not include poisoning, accidents, or behavioral problems, as training philosophies and environments vary amongst individuals. Temperament issues are not covered as they can be caused by a lack of training, discipline or proper dog socialization. All dogs must not be over exercised during their growth period. Over exercising is as follows: overly running with the dog or jumping the dog. The owner is responsible for all transportation costs to and from the seller. This contract is not valid outside the United States and Canada. After these qualifications have been met, you may choose a replacement puppy from any of our litters, subject to availability. No cash refunds are given. Deposits are non-refundable. No further or previous guarantees are implied either verbally, written or otherwise stated. This agreement represents the total agreement between seller and buyer and no other terms or conditions shall be valid to this sale. The buyer has read this agreement and agrees with the terms and conditions herein. In the event of any litigation in connection with this contract, venue and jurisdiction for litigation arising out of or related to this contract shall lie exclusively in Salisbury, NC. In the event that the buyer prevails in litigation, the total awarded value shall not exceed the value of the original purchase price. In the event of dismissal or if the seller prevails in litigation, the buyer will pay to the seller reasonable attorney fees. We hope that you will enjoy your puppy for years to come. We have taken steps to ensure that your new puppy is healthy. Your puppy has been selectively bred for excellent quality, health, intelligence and good temperament. We require that you take your puppy to your vet for a checkup within the first two days after receiving the puppy. We, as the seller have already supplied vaccines according to age and worming every two weeks since birth as noted on the medical record given to you at time of purchase. Until all shots are completed, the puppy may be at risk for Parvo, a very dangerous and fatal disease, as well as others the vaccine covers. Do not have your puppy around unknown dogs, at pet parks, pet stores, or on the floor at the vet until all vaccinations are completed. We require you to keep your puppy on a regular vaccination, health exam and routine deworming schedule by a licensed vet. Puppies introduced to new surrounding are sometimes shy and inactive. This should decline within the first 24 hours depending on the amount of time you spend with them. Remember, they have never been alone before and need a lot of love and play. You will receive a small bag of puppy food. If you decide to change foods, we recommend that you do it gradually, as this can cause upset stomach, diarrhea, and dehydration. As the seller, I certify that this dog/puppy is free from illness and defects, and does not appear clinically ill from parasitic infections. All information provided is true to the best of my knowledge and belief.